Restrict access to the entire app: You can upload a list of authorized users in the "People" section (just the e-mails are enough). For an extra layer of security, you have the option to set up email verification to confirm their identity. Here are the links to learn more about the benefits of pre-created profiles and how to upload attendees in a multi-event app. Limit access to specific events: You can limit the ability to join specifics events within your multi-event app container. This can be done with a unique "event code" that users need to enter only once, or by creating a specific list of pre-joined attendees. Web App Password Protection: When restricting access to an event or entire app you'll also have to set up a password for your WebApp, as it doesn't support profiles or any other social functionality. Note that you'll need to share the password with attendees in an external communication. Settings 1 and 3 are available on step 3 of the app building process and can be updated anytime and do not require the app to be reviewed by Apple or Google. 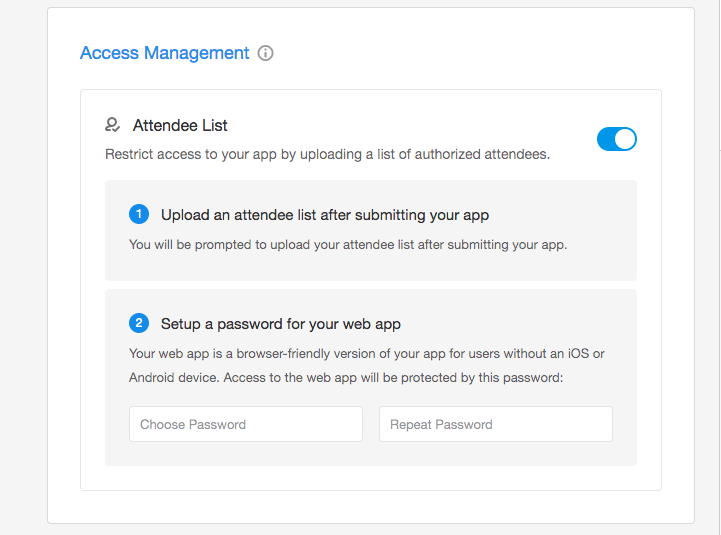 When an attendee whose email hasn't been added to a list of profiles is trying to access the app they get a prompt with an email of a person they can contact to help them gain access to the app/event. By default, this is the email associated with your Attendify account, but it can be changed at any time in the Access Management Settings after the app is submitted. Please keep in mind that you always have the option of leaving your app completely open and allowing users to create their own profiles and join your events. We give you the option of securing your app, but doing so is entirely up to you and is not right for every event. At the event level you have two options for securing your event. You can add an event code or restrict access, as mentioned above. 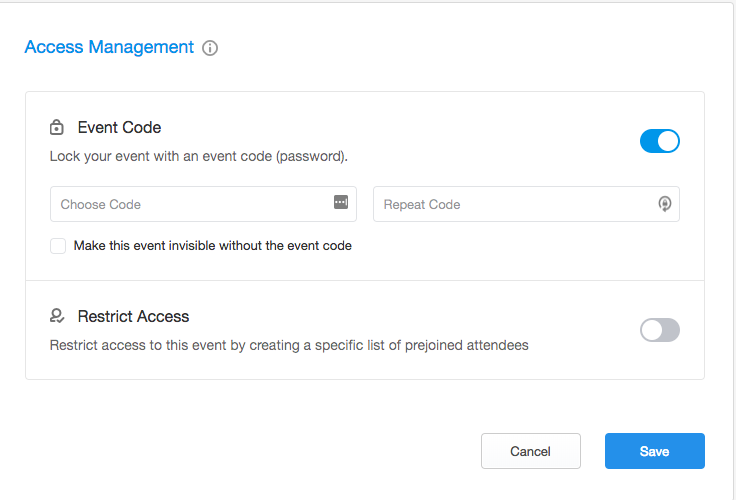 For the event code you simply enter the event level of the app head to the settings icon and then select access management. From the enable the event code feature and type in your code. You also have the option to make the event invisible in the container to everyone who doesn't have the code. Attendees will be able to enter the code by opening the app menu and selecting event code.